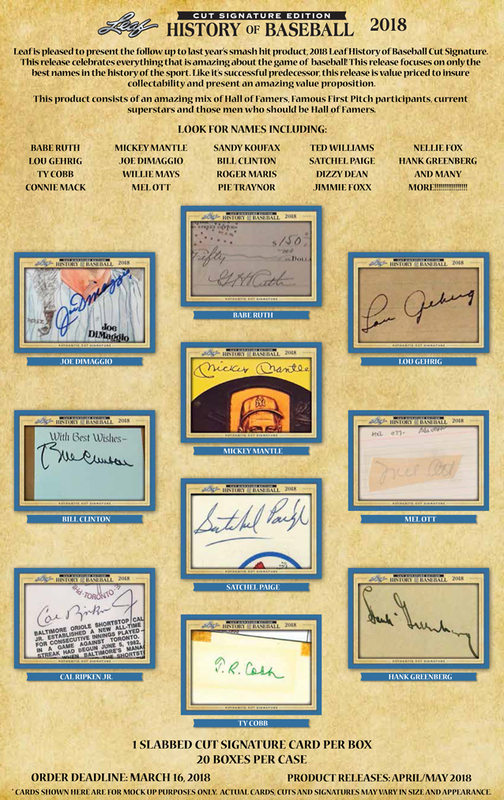 Leaf is pleased to present the follow up to last year’s smash hit product, 2018 Leaf History of Baseball Cut Signature. This release celebrates everything that is amazing about the game of baseball! This release focuses on only the best names in the history of the sport. Like it’s successful predecessor, this release is value priced to ensure collect-ability and present an amazing value proposition. This product consists of an amazing mix of Hall of Famers, famous first pitch participants, current superstars and those men who should be Hall of Famers. LOOK FOR NAMES INCLUDING: Babe Ruth, Lou Gehrig, Ty Cobb, Connie Mack, Mickey Mantle, Joe Dimaggio, Willie Mays, Mel Ott, Sandy Koufax, Bill Clinton, Roger Maris, Pie Traynor, Ted Williams, Satchel Paige, Dizzy Dean, Jimmie Fox, Nellie Fox, Hank Greenberg, and many more!!!! Each box contains 1 slabbed Cut Signature card per box.